We are security experts with 15+ years of experience. All businesses that came to us for help in solving security issues in their web systems had one common problem. They approached the security of web applications as “fire fighting”, or even worse - all discovered vulnerabilities went to the bottom of the backlog, because business features development was always of higher priority for them until… they became a victim of a successful cyber attack. Therefore, we decided to develop a product for companies with a lack of time, resources or expertise that could give them a security process out of the box: constant monitoring and log analysis for timely threats detection, effective incident management, allowing to control teams involved in incident response, as well as smart prevention, providing with automate response to simple or repeated attacks. In this way сyber attacks will no longer be a tragedy. 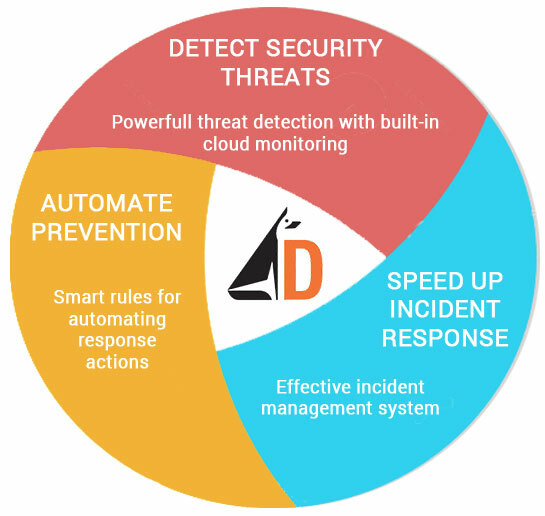 Using Dhound you will have a clear mechanism for dealing with any cyber threat, from its timely detection and response to its prevention in the future. smart prevention allows to stop repeted attacks using other security tools. Web security. Internet is a very aggressive environment, and the number one task for any enterprise is to secure exactly what is connected to the Internet. Dhound - is the right tool for your cloud, web servers and web applications to monitor security. Simplicity in installation and configuration process. You do not need to be a security geek to setup Dhound. Any IT specialist will cope with this. Dhound is used by IT teams who make high demands on security of their web products but are limited by time, expertise and resources.